A clenbuterol (CLB) molecule-imprinted monolithic stationary phase (MIMSP) with specific recognition for CLB and some other β2-adrenergic receptor agonists was prepared by in situ polymerization technique utilizing methacrylic acid as a functional monomer, ethylene glycol dimethacrylate (EDMA) as a cross-linking reagent, and low polar solvents (toluene and dodecanol) as porogenic solvents. The optimal polymerization conditions were as follows: the molar ratio of template:monomer:initiator was 5:20:1, EDMA was 85% (v/v) in the total volume of monomer and EDMA, and toluene was 18% (v/v) in the total mixed porogen. 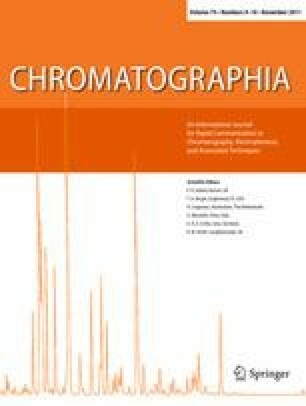 The selectivity of the stationary phase for CLB and other β2-adrenergic receptor agonists was evaluated by high performance liquid chromatography. Scatchard analysis was employed to explore the recognition mechanism. Then the CLB-MIMSP was used as a solid phase extraction (SPE) stationary phase for concentration and purification of CLB from pig liver samples. The results showed that the obtained CLB-MIMSP possessed high selectivity towards CLB and moderate selectivity towards some other β2-adrenergic receptor agonists with characteristics of easy-made. The limit of detection was 10 ng g−1, and recoveries of CLB were 99.16–113.06% with RSD 4.55–11.81% for the spiked pig liver samples. The CLB-MIMSP could be a promising SPE absorbent in CLB biological sample pretreatment. Financial support of this work by National Natural Science Foundations of China (No.30873193) to Qiang FU is gratefully acknowledged. The authors also thank professor Jun Haginaka from Mukogawa Women’s University, Japan, for his helpful discussion in molecularly imprinted polymers preparation.